here's yet another thread of opinions and suggestions on yet another unexplained feature of Voynich drawings, this time, those umbrella/half-pinecone/whatever shaped things in the balneo section. You all know what I'm referring to, I'm sure: You are not allowed to view links. Register or Login to view. They're on 78r, but also, with some variation, on a few other folios. Just to get the thread started, here's one image I found when looking through a bestiary, MS. Bodl. 602. (Mid 13th C) The entry is for Mermecolion, which as I have just learned, is another name for pearl. F34r: This relates to the origin of pearls. From what I understand, that central shape is a close-up of one valve of the pearl-oyster. The text explains that the oyster opens at dawn, allowing it to absorb dew and starlight, which produce the pearl, which is pure like Mary. Yeah, I know, it doesn't have a raised central pod like those Voynich shapes do, and it lacks those extra scalloped bits underneath, but I thought it might make a nice conversation starter anyway. When I was still a little voynichero, my 'theory' for this folio is that it represented a diagram for making brandy. Brandy is made by distilling an already fermented drink, like whine. So I took the things on top to be berries, from which the juice flows through a series of filters. The juice then stays in a closed barrel, which is represented by the nymphs ducking to stay inside the outline. Finally, the wine is distilled into another vessel. I'm not sure what they are, but they do seem to be the origin of the water flow. That's something to take into account. It is a very interesting detail, thank you for sharing it! I think that good parallels could be find in manuscript illustrations of hanging pyxes, canopies or pavilions, but I have not found anything convincing so far. I attach a couple of not-so-good examples. The strange tubes that appear on the same page were discussed You are not allowed to view links. Register or Login to view. by Ellie and others. Yes I always think of them as of a tent of a travelling circus or a carousel roof. Yet what relation they may have to the subject matter of the VMS scenes? In the latter, some patterns of natural elements seem to emerge from under those tents. Why would elements be associated with a carousel? (10-04-2016, 03:20 PM)Anton Wrote: You are not allowed to view links. Register or Login to view. Yes I always think of them as of a tent of a travelling circus or a carousel roof. Yet what relation they may have to the subject matter of the VMS scenes? In the latter, some patterns of natural elements seem to emerge from under those tents. Why would elements be associated with a carousel? Those canopy shapes and lumpy shapes have always looked like umbrellas or tents and grottoes to me and it turns out that's possibly what they are. 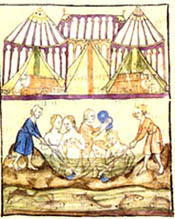 When I did some research on natural spas in medieval times, it appears that those with time (and money for the fancier places) went camping at scenic resorts to bathe in natural pools and thermal vents the same as we do now. Plus, many of those places had caves and grottoes. They brought tents, food, and something that looks like blankets or sleeping bags and had a vacation in the waters no different from modern times. It would be consistent with the theme of medicine and healthful practices suggested by the VMS pics. I think, the balneo section are not normal bathing drawings. Normal bathing drawings between 1300-1600 have specific details that can not be seen in the vms. the vms would should those very particular items and/or details. But they do not. A bathing ritual makes more sense. There are several rituals that can be mentioned but the most obvious is the eternal youth. The issue of eternal youth is a common recurring thing in medieval manuscripts. In this particular VMS picture (You are not allowed to view links. Register or Login to view.) you could see that "the life elixer is freely flowing as oil from the tree of life into the bath of youth". The umbrella/pinecone as you describe, then is a symbolic representation of the tree of life/youth. It could easily be a pinecone. Read more: You are not allowed to view links. Register or Login to view. They do look like tents of some sort... But the issue with this interpretation is then: why is water/steam underneath them, and apparently flowing from them? Is this some sort of sauna-tent? If pinecones: why are they only half pine cones? Why does water appear to be flowing from them: is some essence being extracted? "The pine cones , in pure extract or taken with sweet wine or cucumber seeds , promote urine and relieve the bladder and kidney pain. Taken with purslane extract they soothe stomach jump [hiccups? vomiting?] , help to alleviate the weakness of the body and counteract the corruption of juices . All the pine cones, freshly crushed and cooked in sweet wine, are a good remedy for cough and obsolete consumption when the drink is taken every day from them in the administration of 3 cups." Dioscorides also gives uses for the rest of the pine tree and nuts in paragraphs 87 & 89. However, I can't find any use for pine cones relative to therapeutic bathing. There are lots of pictures of baths with canopies over them online but I wanted them circular and with a raised pod-like thing in the center. The issue is: in the Voynich these things are not directly above the bathtub, but seem more distant, connected to the steam/water flow. This one seems to depict the kind of scene JKP was referring to, but all they say is "14th C bathing treatise": anybody know where it's from? The second one actually seems to follow the same layout as many pages in the Balneis: tents in the top half, bathing scenes in the other. You are not allowed to view links. Register or Login to view.. I think those represent two different aspects of the bathing place rather than one scene with tents and baths though. 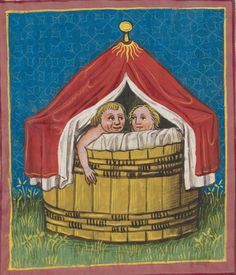 The Balneis is a 14th century bathing treatise, so I think it's related. Yes Koen Gh, it is a Balneis, and I should have said so. What I meant is I don't know which specific MS this particular one is. The circular tent motif seems to be a constant across various versions. And throughout all of these suggestions, the questions remain: if the objects are tents, then what is the weird scalloped stuff going on underneath them? If they are pinecones, then why are they cut in half with a raised central pod?